If not, click the picture below to check out all of the other knitting lessons you’ve been missing. That Rebecca…….I sure love her step-by-step, instructions. And her clarity. Thanks again Rebecca, for teaching us all how to knit over here on Make It and Love It! Hey Knitters! (See, you can officially be called a knitter now, neato!) Rebecca Danger here, back for Week 5 of Learning to Knit. This week I am going to show you how to combine the knit and purl stitches together in one project. This is pretty simple, especially once you get the rhythm down, but very important to learn since most every knit project out there is made up of combining these 2 stitches together. When you PURL every row of a project, like on our second washcloth, it is called “Reverse Garter Stitch.” (This is very uncommon, since Garter stitch and Reverse Garter Stitch look identical). Stockinette Stitch is great, but if that is all you do, the edges will curl up as you knit. The only way to avoid the curling is to combine knit and purl stitches in one row. I am going to show you a very common way of avoiding the curling problem as we make up a third washcloth this week by making a Garter Stitch border around a square of Stockinette Stitch. Okey, dokey? See the yarn in the back now? 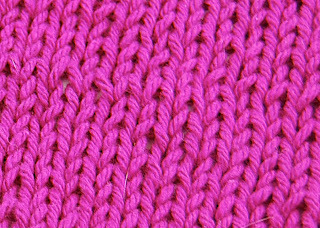 Knit the last three stitches. Knit (only) across the next row. See the little “V’s” starting to take shape? Tah-dah! Good, now bind off and weave in your ends (see here). Awesome, finished washcloth! Yeah! You’ve made something beyond a “first project” now. Next week I am going to be back and help you to read a pattern so you can tackle the knitting world. Sound good? Thanks! I am loving this series. I am excited to get started on week 5. One question: I borrowed a book from my mom with lots of wash cloth patterns and noticed there are other things I would like to know how to do. Can you do a post teaching the extras like yarn over, left twist, right twist, and psso? Thanks! I love your patterns! I just ordered the sock monster and I'm finding it soo easy to follow. Great job! Thank you, thank you, thank you! I started learning how to knit a few days before the series started and this has been such a great help! i wasn't a huge fan of my purl-washcloth but my first and third are coming along swimmingly! Rebecca, I love your patterns and your book is on my "wish" list. Mother's Day is coming up soon, maybe I can give some hints! Thanks for the great series.